YOU MUST BE 18 YEARS OR OLDER TO PURCHASE ANY OF OUR PRODUCTS. By purchasing any product you testify that you are 18 years of age or older! If you are pregnant, have any heart problems, or if you have any health issues/problems, we ask you to consult a doctor before using any of the products sold on this website. Our website contains information, links, images and videos which are sexually explicit. If you are under the age of 18 (21 in some jurisdictions) and if such material offends you or if it's illegal to view, you must stop the use, view, browse or doing business with us and please close this website immediately. You agree that the sexually explicit material that you view or purchase is for your own personal use and you will not expose minors to the material. By using this website or purchasing any item from us, you acknowledge the desire to receive/view sexually explicit material. You agree that the viewing, reading, purchasing, or downloading of sexually explicit materials does not violate the standards of your community, town, city, state, or country. You are solely responsible for any false disclosures or legal ramifications of viewing, reading, purchasing, or downloading any material in/from this site. Furthermore, this website nor its affiliates will be held responsible for any legal ramifications arising from fraudulent entry into or use of this website. 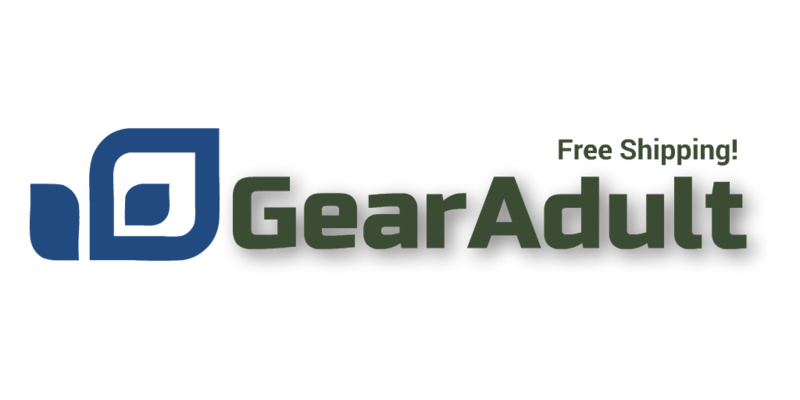 The term 'Gear Adult' or 'us' or 'we' refers to the owner of the website whose registered office is at PO Box 1156, Newark, CA 94560. The term 'you' refers to the user or viewer or the customer of our website. Waiving the Signature— If you choose to waive the signature, that is to ask us not to request for signature upon delivery, you take full responsibility if the package is lost. We ask for signature when the package value is more than $100.00. We have enabled the option to cancel the request for signature upon customers' request because some customers have indicated they are not home during postal delivery hours and they don't want to go to the postal office. So this option is created in order to tell the postal service to leave the package at the address when the recipient is not present. This is an optional service and if you wish not to use it, please don't check that box during checkout. Trademarks—The trademarks, names, logos and service marks (collectively “trademarks”) displayed on this website are registered and unregistered trademarks of the website owner. The trademarks, names, logos, and service marks of the items available for sale belong to the related manufacturer, service provider, and their owner. Nothing contained on this website should be construed as granting any license or right to use any trademark without the prior written permission of the trademark owners. Disclaimer of liability—The website owner shall not be responsible for and disclaims all liability for any loss, liability, damage (whether direct, indirect or consequential), personal injury, death, or expense of any nature whatsoever which may be suffered by you or any third party (including your company), as a result of or which may be attributable, directly or indirectly, to your access and use of the website, any information contained on the website, your or your company’s personal information or material and information transmitted over our system, or the merchandise bought via this website. In particular, neither the website owner nor any third party or data or content provider shall be liable in any way to you or to any other person, firm or corporation whatsoever for any loss, liability, damage (whether direct or consequential), personal injury, death, or expense of any nature whatsoever arising from any delays, inaccuracies, errors in, or omission of any share price information or the transmission thereof, or for any actions taken in reliance thereon or occasioned thereby or by reason of non-performance or interruption, or termination thereof. Applicable laws (choice of venue and forum)—Use of this website shall in all respects be governed by the laws of the state of California, U.S., regardless of the laws that might be applicable under principles of conflicts of law. The parties agree that the California courts located in Alameda county, California, shall have exclusive jurisdiction over all controversies arising under this agreement and agree that venue is proper in those courts. If for any reasons whatsoever, you report or initiate a dispute on a transaction, we will share the information that we have about that transaction or other transactions that you have had with us with the entity that handles disputes. International Shipping—International customers are those who buy the item and expect it to be delivered outside US regardless of their payment address. International customers are responsible for custom clearances, VAT, and fees. International customers are also responsible for the item and the legal issues that it can cause the port of entry, processing centers and the postal services fees and regulations of their country. We accept no fees, lost claims, custom charges, or infringement of foreign laws. You, the international customer, are responsible for such issues.